This is an eyewitness account of the events in Tehran on 15th June 2009. It was posted on Facebook, where you can read the original version. I left my home in Tajrish along with my family at 3 p.m. We went down Valiast Street which is the main northern-southern avenue in Tehran and entered the Evin Exp'way which leads to Enghelab Street. We knew that people are supposed to gather in Enghelab Sq. (Revolution Sq.) at 4 and march toward Azadi Sq. (Freedom Sq.). From Gisha Bridge onwards, we saw people walking down. Cars were blowing their horns and people were showing victory sign. We went to Navvab Street and parked our car at the end of the street. Then we took a taxi to bring us back to the Enghelab Street. On our way, near Jomhouri Sq. (Republic Sq. ), I saw a group of about 20 militia with long beards and batons on motorbikes. My hand was out of the car window with a little green ribbon (the sign of reformists) around my finger. One of the militia told me to throw that ribbon away. I showed him a finger. All of a sudden, about 15 people attacked me inside the car. They beat me with their batons and wanted to pull me out. My wife and my daughter who were sitting in the back seat cried and hold me tight. I also hold myself tight on the chair. They wanted to shatter the car windows. The driver went out and explained that he is a taxi and we are his passengers and he has no fault. After about 5 minutes,they left. My elbow hurts severely. Then, a young man from their group came and kissed my elbow! I told him: You know, I don't hate you. I am like you with the only difference that I know more and you are ignorant. He apologized and left. What I saw today was the most elegant scene I had ever witnessed in my life. The huge number of people were marching hand in hand in full peace. Silence. Silence was everywhere. There was no slogan. No violence. Hands were up in victory sign with green ribbons. People carried placards which read: Silence. Old and young, man and woman of all social groups were marching cheerfully. This was a magnificent show of solidarity. 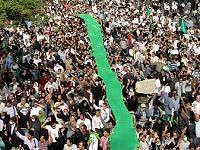 Enghelab Street which is the widest avenue in Tehran was full of people. I was told that the march has begun in Ferdowsi Sq. and the end of the march was now in Imam Hossein Sq. 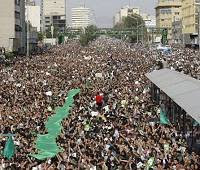 to the further east of Tehran while on the other end people had already gathered in Azadi Sq. The length of this street is about 6 kilometers. The estimate is about 2 million people. On the way, we passed a police department and a militia (Baseej) base. In both places, the doors were closed and we could see fully-armed riot police and militia watching the people from behind the fences. Near Sharif University of Technology where the students had chased away Ahmadinejad a few days ago, Mirhossein Mousavi (the reformist elect president) and Karrubi (the other reformist candidate spoke to people for a few minutes which was received by cries of praise and applause. I felt proud to find myself among such a huge number of passionate people who were showing the most reasonable act of protest. Frankly, I didn't expect such a political maturity from emotional Iranians who easily get excited. My family and I had put stickers on our mouths to represent the suppression. Placards that people carried were different; from poems by the national poet Ahmad Shamlu to light-hearted slogans against Ahmadinejad. Examples include: " To slaughter us/ why did you need to invite us / to such an elegant party" (Poem by Shamlu). " Hello! Hello! 999? / Our votes were stolen" or " The Miracle of the Third Millenium: 2 x 2 = 24 millions" (alluding to the claim by Government that Ahmadinejad obtained 24 million votes) , "Where is my vote?" , " Give me back my vote" and many other. We arrived in Azadi Square where the entire square was full of population. It is said that around 500,000 people can be accommodated in this huge square and it was full. Suddenly we saw smoke from Jenah Freeway and heard the gunshot. People were scared at first but then went forward. I just heard the gunshots but my sister who had been on the scene at that part told me later that she saw 4 militia came out from a house and shot a girl. Then they shot a young boy in his eye and the bullet came out of his ear. She said that 4 people were shot. At least one person dead has been confirmed. People arrested one of the Baseeji militia but the three others ran away when they ran out of bullet. At around 8 we went back on foot. On the way back people were still in the street and were chanting Allah Akbar (God is Great). I was coming home at around 2 a.m. In parkway, I saw about ten buses full of armed riot police parked on the side of the street. Then I saw scattered militia in civil clothes with clubs in hand patroling the empty streets. In Tajrish Square, I saw a very young boy (around 16) with a club who was looking at the cars to see if he can find something to attack. I don't know how and under what teachings can young boys change into militia. I came home. Tomorrow, people will gather again in Valiasr Square for another peaceful march toward the IRIB building which controls all the media and which spreads filthy lies. The day before Yesterday, Ahmadinejad had hold his victory ceremony. Government buses had transported all his supporters from nearby cities. There was full coverage of that ceremony where fruit juice and cake was plenty. A maximum of 100,000 had gathered to hear his speech. These included all the militia and the soldiers and all supporters he could gather by the use of free TV publicity. Today, at least 2 million came only relying on word of mouth while reformists have no newspaper, no radio, no TV. All their internet sites are filtered as well as social networks such as facebook. Text messaging and mobile communication was also cut off during the demonstration. Since yesterday, the Iranian TV was announcing that there is no license for any gathering and riot police will severely punish anybody who may demonstrates. Ahmadinejad called the opposition as a bunch of insignificant dirt who try to make the taste of victory bitter to the nation. He also called the western leaders as a bunch of "filthy homosexuals". All these disgusting remarks was today answered by that largest demonstration ever. Older people compared the demonstration of today with the Ashura Demonstration of 1979 which marks the downfall of the Shah regime and even said that it outnumbered that event. Here are the crowds in Tehran, protesting about the election results. This picture was posted on Twitter just a few minutes ago. 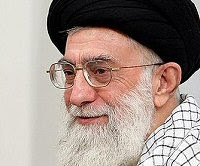 Read the latest news from Tehran as it develops on Twitter. Some of the streams of tweets are coming from people on the streets in Tehran, posted from mobile phones (this guy deserves a medal but is probably in line for something much harsher). Others are comments from others not involved in the protest. And then there are also comments, good wishes, prayers, and thoughts from people world wide. There are more photos online, and the major news channels have reports, for example the BBC. It'll be all over tomorrow's front pages for sure. Live news reporting is one of the things that Twitter does best.